So, about these jet flyovers..
Is there somewhere I can disable them? Or reaalllly lower the frequency? It was cool at first, but now I have around 6 circling me at all times, and it's super distracting. 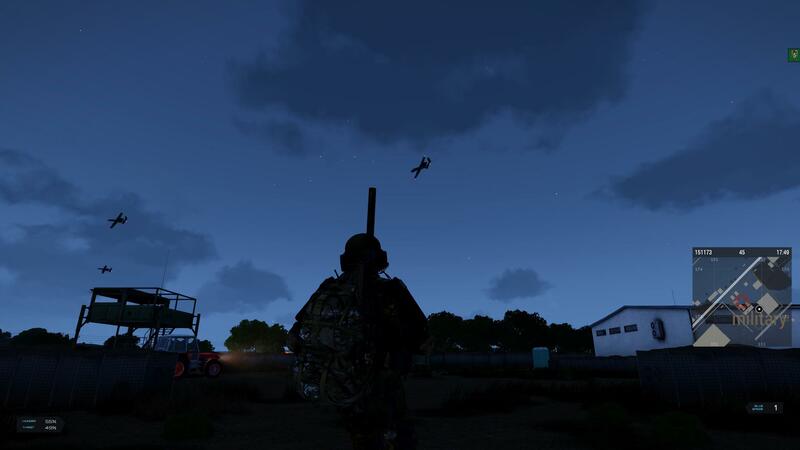 class SupplyBox //Drops a supply box on a parachute next to a random airport on the map. The box may contain items. The box can be transported to a territory and installed to become a normal storage container. types = 						//These are different types of boxes can be dropped. You can specify the cargo a box should contain. The type of box is chosen randomly from the following list. Add a type multiple times to increase the chance of being used. If you have 6 flying around you, you've got a real problem with your server since they fly over and keep going. By default, they fly over every 30 - 90 minutes. It's per player, so if there is 3 players in an area you could easily see 6 - 8 of them and we do on our server. Players hate them, I love them. Check the code though Zed, it shows how they are created, how they behave and frequency. I know before you have said "I don't use infistar" But if you did (maybe you do now), you can Shift I and see who the owner of the jets are. Its best when they collide. BOOM - so awesome. I may change the models to something like drones or something rather than the jets, it would be a bit more realistic. I switched mine over to the prop planes and they're way less annoying and more entertaining. The handful of players on our server seem to enjoy them more as the Censna and AN2. Are you sure it's PER PLAYER? Also, I've been using Inifstar for years. Not sure where you got that from. It was A3launcher ... "I don't use A3 Launcher". we have seen 10 over the traders, they don't last long cause they start crashing into eachother. For me all they have ever done is fly in a line from one side of the map to the other (over my head). I wonder if they only fly round if there more then 1 online as so far I am only running a local test server. I tried to make it so I could execute it and have them fly over me, but they just circle around for a bit off the map. I've never seen them circle. I've only seen 1 at a time and they flew straight overhead and kept going.